This is a guest post by Austin Louis on creating sketchnote videos for a TEDx event in Portland, Oregon. Read Part 2 here, and Part 3 here. If you’ve ever seen an episode of Visual Conversations, you probably know that I’m a student at Wayfinding Academy. There are a lot of cool and interesting things happening within that program, but I think some of the real learning lies outside of the classroom, working in the community with local organizations. On event day, right before each speaker walks out onto the stage for their talk, a short video clip plays that displays the name of the speaker and the title of their talk. At past events, these videos have been animated stop-motion videos, sketchnote videos, and more – many of them created by Doug. Well, this year, I have been presented with the opportunity to make these intro videos myself! This was a total shock to me. 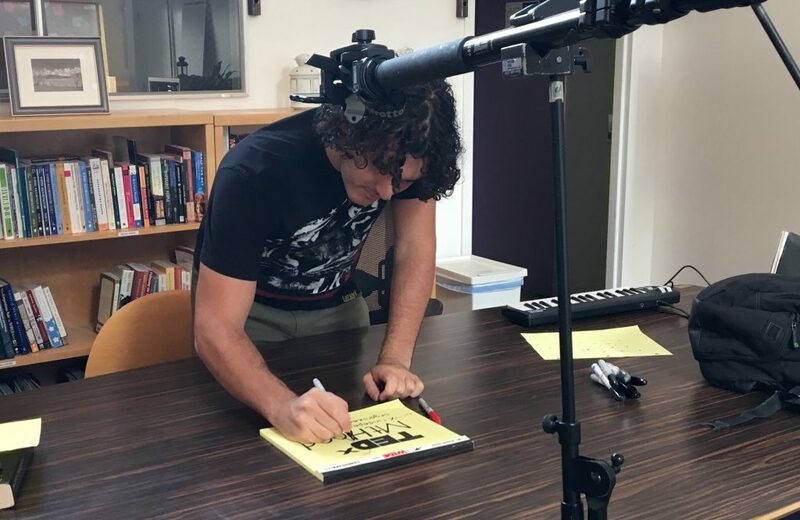 I mean, it was only 6 months ago that I was introduced to the world of sketchnoting when Doug and I sat down for our very first episode of Visual Conversations. It all still feels so new to me – I still feel like a beginner. And now, I’ve got my first gig with an organization like TEDxMtHood! It’s exciting and scary and stretchy. This week I entered into the concept phase of this project. I wanted an idea for these videos that I could test out. The theme of this year’s event is Alchemy, so I thought it would be cool to have some element of transformation in the video clips. However, I was also mindful of my current skill level and knew I needed an idea that fit within my current abilities. I decided to make the concept as simple as possible and treat it as a first draft. I figured that it would be easier to start simple and get more complex, rather than the other way around. 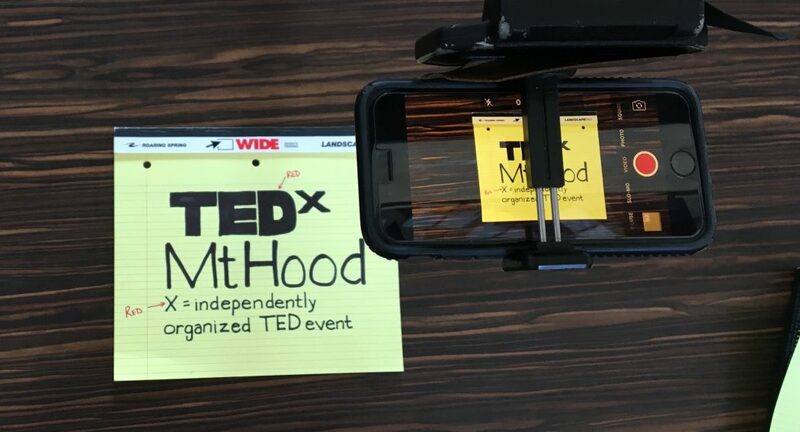 The idea I came up with was sketching a TEDxMtHood main slide on a piece of paper, crumpling it up, unfolding the paper, and revealing the speaker’s name and talk title. How would I do this? Here’s where Doug came into play. He mentioned that he had seen this sort of transformation effect done before, and it actually wasn’t too hard to recreate. In fact, it could even save me time. To get this effect, the video would need to be recorded in two shots. The first shot would be the typical sketchnote video style, where I would record myself sketching out TEDxMtHood and all the other information. Then, I would crumple the paper up into a ball in my fist and end the shot there. Simple enough. The second shot would need to look like the paper from the first clip is being uncrumpled and flattened, revealing a completely new page. To do this, the shot would have to be filmed in reverse to achieve the uncrumpling effect when played back in real time. If we could get a shot like this to work, it would save a whole bunch of time by allowing me to prepare the pages for the second shot ahead of time, rather than sketching them live on camera. That sounded good to me! I grabbed some scrap paper, some markers, my iPhone, and tripods to test out the concept. 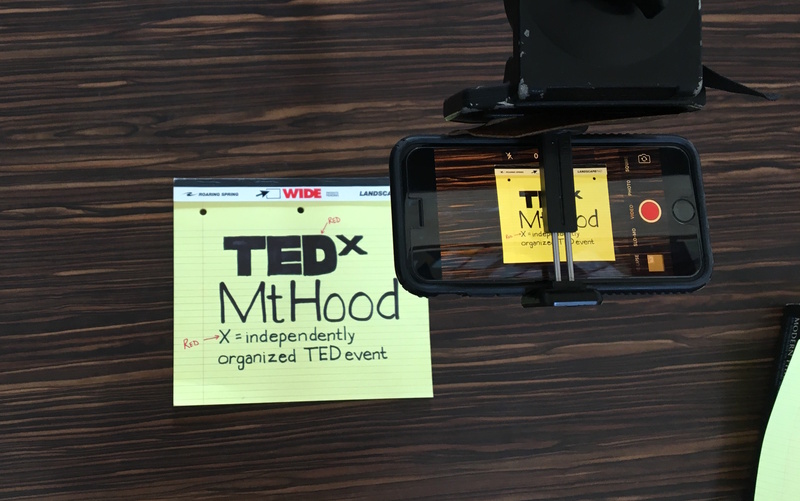 I drew out a real rough “TEDxMtHood” on the scrap paper, crumpled it up, and recorded the first clip, no problem. Then, I scratched “Speaker Name, Talk Title” onto a second sheet of paper, laid it down, hit record, and crumpled it up. I took both of these clips into some editing software and reversed the second clip by adjusting the “time stretch” to -100%. I added some random music, played it back and the concept seemed to work! Now, I know that this clip may look rough – the text looks messy, the transition from the first clip to the second clip is off, the lighting isn’t too great – but this concept looks extremely promising to me. I’ve got a better idea of where to go from here and I have a solid foundation to build on. What is one project you’d like to take on in the next month or two? How might you use Thinking, Planning, and Testing to build a concept for this project? In the meantime, I’ll move from the concept stage to the preparation stage – this is where all the real sketchnotes take place! See you next week.